Metro Morning food guide Suresh Doss visits Bong Lua Vietnamese Restaurant known for its aromatic crab soup. Bong Lua Vietnamese Restaurant is at 2572 Birchmount Rd. There's nothing like a hot bowl of Vietnamese noodle soup to warm your senses and soul during the winter months. I was introduced to it in high school. A friend of mine insisted on visiting a different Vietnamese restaurant every week for a bowl of pho. We never ordered anything else — only the national dish of Vietnam. It is a gateway dish, sort of like butter chicken to Indian cuisine, and one that fills your belly at little cost. It's also a soup that allows you to choose your adventure. You can have basic beef broth pho with cooked meat or rare meat, or you can get a little adventurous with tripe, blood sausage and so on. We're blessed with an endless supply of pho shops throughout the city. There are clusters of Vietnamese communities in Scarborough, notably in the Agincourt and Leacock neighbourhoods. You'll find a number of mom and pop shops scattered in this area, serving Vietnamese charcoal barbecue, endless variations of noodle soups and steamed rice rolls. One of my favourite spots is Bong Lua Vietnamese Restaurant, located at a nondescript plaza at Birchmount Road and Huntingwood Drive, close to a thriving Vietnamese community. Quy Huang Dang learned to cook Vietnamese dishes when he was a young kid. "I learned from my mother. I was always in the kitchen, learning to chop vegetables, how to make crab paste." In 1990, Dang immigrated to Canada, along with his brother. He eventually settled in Scarborough and worked odd jobs for a number of years. One of Dang's favourite spots for Vietnamese was a small restaurant at Huntingwood Square (Birchmount and Huntingwood). Pho 33 Vietnamese restaurant was a popular spot among the local Vietnamese community. Like Dang, I used to frequent the spot whenever I was in the area and craving a bowl of pho. 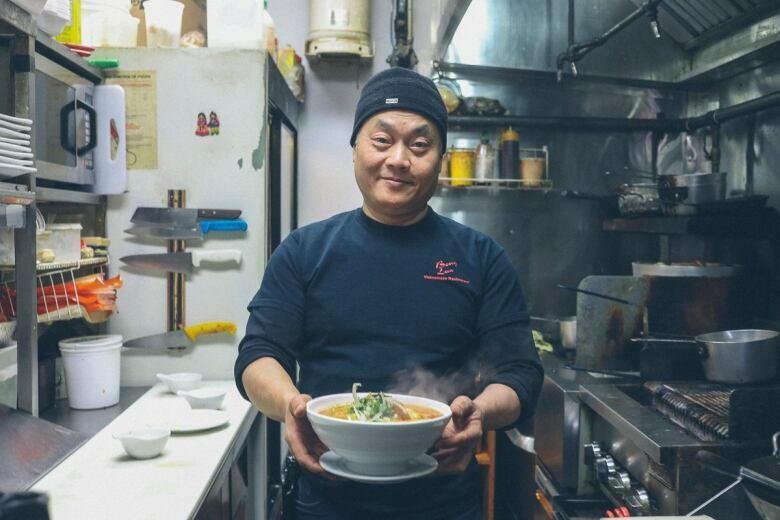 "The service was good, the people were nice and the broth was good," Dang said. One day, he noticed that the owner had listed the place for sale. "I spoke to my brother and decided, 'Why not? Let's take it over.'" Dang told me he had a few reasons for taking ownership of the space. He wanted to keep the local community alive and thought it was an opportunity to showcase northern Vietnamese cooking. "A lot places in Scarborough feature southern-style Pho; slightly sweeter and very full of spice. I prefer very light and delicate broths like they serve in Hanoi," Dang said. 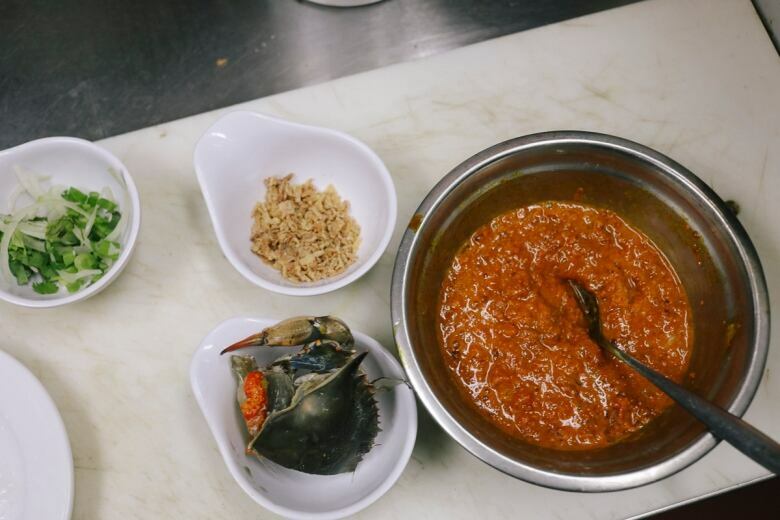 Quy Huang Dang house-made crab paste is the 'secret ingredient' in Bong Lua Vietnamese Restaurant's crab soup. 1:17Dang changed the name of the restaurant to Bong Lua and presented a menu of noodle soups and classic Vietnamese fare. But it was the pho that took off instantly, and it was the pho that attracted me to the restaurant. I had heard about the "new pho spot in town" when it first opened up in 2011 and stopped by for lunch one day. The pho tai nam — a simple bowl of beef broth with rare flank steak — was delicate and sublime. The nature of the broth was this underlining flavour of beef stock, highlighted very lightly by vegetables and spices. It became an instant favourite of mine and I would visit regularly in the fall and winter months. While the pho tai nam and other basic bowls of pho are great, the restaurant has another secret gem. A few years ago while I was enjoying a bowl of pho, the lady next to me was presented with a large bowl of bright red soup with a crab shell sticking out in the middle. It had this fishy, peppery fragrance. I asked her what it was, and she said that it's the best crab soup she's ever had in Scarborough. 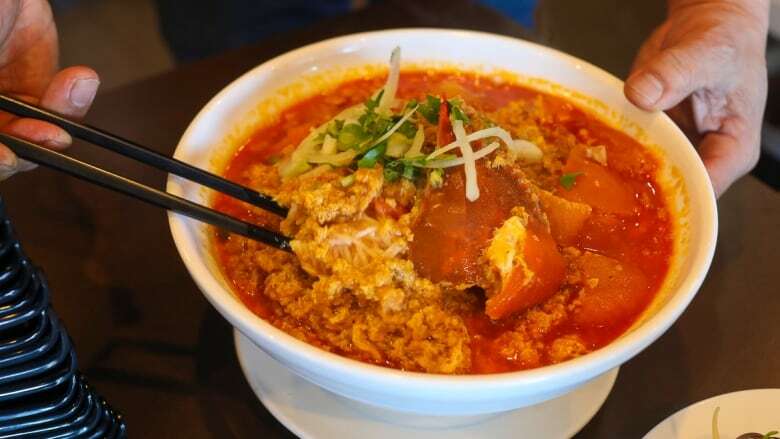 Known as bun rieu, it's a tomato broth soup served with freshwater crab and crab paste. 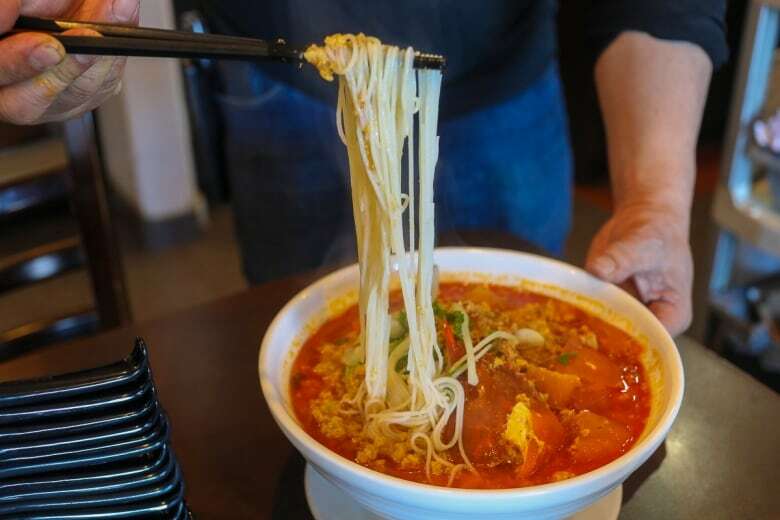 I ordered a bowl of bun rieu at my next visit. While the classic pho dishes are a delicate dance of broth flavour, herbs and spices, bun rieu is the complete opposite. It's a punch of spice. Fish and crab flavours hit all your senses from the first spoonful. It is intensely aromatic and has this soul-warming quality to it. Dang demonstrated how he makes each bowl. "The soup is never pre-made. I make it when I get the order, so sometimes it takes a few minutes." In the Bong Lua kitchen, there are many large vats that cook the restaurant's beef and chicken broths. Dang starts cooking his stock very early each day, filling these vats with meat bones, whole onions and a few spices. He slowly simmers the stocks until they reach peak broth flavour. "I cook it four to five hours minimum," he said. For the bun rieu, Dang ladles some of his chicken stock into a pot and brings it to a boil along with a handful of cut tomatoes. A few minutes later, he tosses in a whole freshwater crab and pulls a container out of the fridge. Inside the container is a bright red paste — Dang's pièce de résistance. He drops a healthy spoonful of paste into the stock and lets it cook for a few minutes. With lightning speed, he preps a bowl of fresh vermicelli noodles, and then pours the broth over it. "That's it. This is my favourite soup." "The crab paste is the key ingredient. It's my secret ingredient," Dang said when I asked about it. He won't reveal what's in it, but has repeatedly said that it has taken him many years to perfect it. Since then, I've had my fair share of crab soups in the Greater Toronto Area. During a recent month-long trip through Vietnam, I spent nearly every morning and night sitting on street-side stools enjoying bowls of crab soup. Nothing I have had anywhere else here comes close to the bowl of bun rieu I have had at Bong Lua. Suresh Doss's weekly food segment airs every Thursday on Metro Morning. Watch for video of his jaunts across the city on CBC Toronto's Facebook page. Do you know a GTA restaurant that Doss should visit? Tweet us @metromorning or send us a message on Facebook. And if you try any of the places he features, we want to see photos! 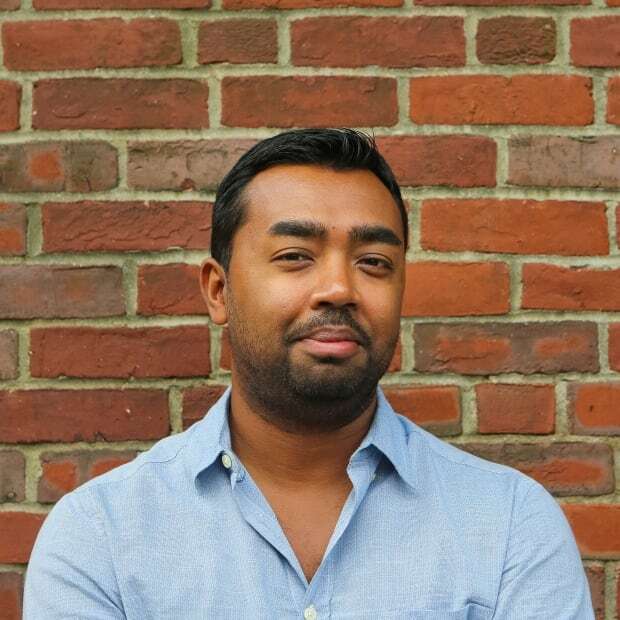 Suresh Doss is a Toronto-based food writer. He joins CBC Radio's Metro Morning as a weekly food columnist. Currently, Doss is the print editor for Foodism Toronto magazine and regularly contributes to Toronto Life, the Globe and Mail and Eater National. Doss regularly runs food tours throughout the GTA, aimed at highlighting its multicultural pockets.